220 Volt guitarist Thomas Drevin joins the RETROFUTURE 8 release party at Jane Doe in Östersund (Jämtland County) on March 4, siding up with drummer Björn Höglund as resident DJ´s for the night. Word is there will be a Battle of The Bands type thing going with Kiss & Deep Purple classics blasting out of the speakers. I´ve known Thomas for a long time, we even did our compulsary military stint together at the F4 Air Force base back in the day. 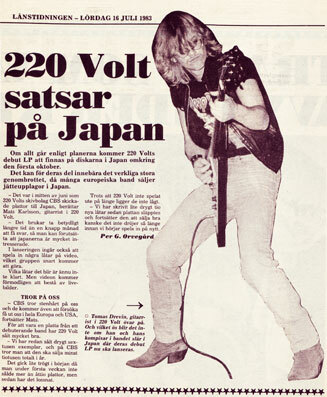 But then there was 220 Volt, the band that he created from scratch with guitarist Mats Karlsson and which got signed by CBS in late 1982. Thomas did two albums with the band back then, “220 Volt” (1983) and “Power Games” (1984), and he has been part of the band ever since the comeback around 2002 again. I also recall a project he had for a while that was called Daylight Dealer (great name for a rock outfit), that never released an album. In any case, what a wonderful thing to see Thomas at this release party next week. Press cutting is from LT (a local newspaper), from July 16 1983 (written by Per G. Orvegård). Got loads of cuttings in the old vaults.